At first glance, the Abyssal Exalted seem pretty vile folk, spreading death and destruction wherever they go. However, there’s a lot more to them than that, and if you are seeking a greater understanding of the Abyssals, are a Storyteller with a plot in which they play a major part or actually are looking to run a game based around Abyssal characters, this book is worth a read. The Introduction gives an overview of the Abyssals and discusses the roles that they might have in your game as adversaries, allies or indeed characters to be played. Like the Solars, Abyssals begin as ordinary human beings with the seeds of greatness, the potential to become a mighty hero. Those who suffer – or are on the brink of – an untimely death may be given the opportunity of Exaltation as an Abyssal instead, provided that they will pledge themselves to the service of the Deathlords and their ultimate goal: the destruction of Creation itself. But all Exalted choose to use their power to further their own ends and force their opinions on those who disagree with them, the Abyssals are no different. Thus runs the argument for those who might be interested in playing an Abyssal. Chapter 1: The Chosen of the Void explores how the Abyssal Exalted came to be. While all are ultimately committed to work towards the destruction of Creation, not all embrace their role willingly, while others bring a variety of motivations to their task. It looks at the background that allowed the situation to develop, the flaws in the Primordials’ original design that made Creation vulnerable to attack and the mistakes that they made which caused some of them to die in conflict and so pave the way for the Underworld to come into existance, created by dying Primordials’ recognition that they could indeed die. But these dead Primordials were trapped, unable to fall into oblivion because Creation still existed, and so they came up with the idea of recruiting agents to destroy Creation. Elegant and convoluted background, which more philosopically-minded Storytellers will want to understand; a rich and strange underpinning to what the Deathlords are trying to accomplish on the dead Primordials’ behalf. Against this background, the Abyssal Exalted are created, and the chapter goes on to cover the recruitment of Abyssal Exalts and the powers that they gain from the Deathlords. Most do not even have an inkling of the background to how they came to be, and likewise they are poorly understood by other Exalted. Next, Chapter 2: The Deathlords looks at the thirteen individuals that command the deathknights and do the bidding of the dead Primordials, the Neverborn. Each, or at least the ones that are known, has a fancy name which in some way embodies its very being. They’re all evil, but each in its own particular way; and naturally they are all extremely powerful. Nine are described here, the remaining four are left for development by Storytellers to suit their needs. Sample servants are also included, its assumed that deathknights – including character ones, if you are playing a game about Abyssal Exalted – number amongst each Deathlord’s staff. This chapter is replete with ideas for how Deathlords can interact with your characters to create fascinating plots, and much detail that will make them come alive within your game. Background presented in all its rich panoply, Chapter 3 deals with Character Creation. It’s recommended that you begin by designing the individual your character was before Exaltation, as more than ever with the nasty aspects of an Abyssal Exalted the changes wrought by Exaltation should drive the role-playing and development of the character. 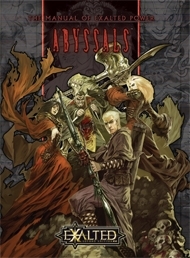 It’s also even more important than in most games that the players work together as a group in creating their characters – Abyssal Exalts by their nature tend to squabble and the group needs to determine how far this is going to go, and ensure that it remains in character without threatening real-world friendships. Each character also needs to know the reason that he made that conscious decision to accept the ‘Black Exaltation’ – it’s a choice, and a bleak one at that, but understanding why the character made that bargain will help you work out his motivations and behaviour. This is a game where understanding your character as a person will inform your role-playing and enhance enjoyment for the whole group. Once the character concept is thought out, the mechanical process of creation follows the standard rules. Chapter 4: Traits shows how deathknights are a subtle corruption of Solar Exalts, using similar but twisted templates, traits and rules. There’s plenty of detail here to enable you to establish the character’s position and capabilities, and it enables the creation of complex backgrounds with plenty of scope to develop plots wound around the very nature of the characters themselves. One glorious example is the Background of Liege – this shows how well the deathknight serves his Deathlord and how, in turn, he is rewarded with assets and less-tangible things as well. Just allowing a character to take this Background, especially at high levels, could be overpowering and unbalance the game, but the wise Storyteller can manipulate the level based on the Deathlord’s perception of the character’s performance, making changes session by session if so desired. Thus is loyal service rewarded and failure or disloyalty punished in the Underworld! There’s also a detailed rundown of each of the Castes available, again a perversion of the familiar Solar ones, being Dusk, Midnight, Daybreak, Day and Moonshadow. Next, Chapter 5 deals with the Charms that the deathknights may learn to wield. Many mirror the Solar Charms that you’re already familiar with, and it might be possible for Solars and Abyssals to teach each other a Charm so as to deduce the appropriate mirror one (if the Storyteller allows it). In customary Exalted style, they all have fantastical evocative names, but anyone wanting to use them is well-advised to study them well and not rely on the name on a character sheet and a quick fumble through the book at the point of use: know your powers and use them wisely! Chapter 6: Necrotech, The Science of Death is not for the squeamish, combining once-living and inorganic material into twisted creatures powered by the magic of reanimation. Through study and practice, necrosurgeons build and maintain all manner of horrors to be used to further the ends of the Deathlords. Each Deathlord has a distinct style in the necrotech he directs his staff to build, perhaps you can even determine which necrosurgeon fabricated a particular creature. As well as understanding the magic, the budding necrosurgeon needs the craft skills necessary to construct that which he would reanimate. For characters wishing to practice this dark art, the necessary game mechanics are given here, and detail-oriented Storytellers may wish to use them as guidance when creating the opposition. Some sample constructs are given to get you started, along with the tools, spells and other gear that the well-equipped necrosurgeon needs to have to hand. Chapter 7 deals with Abyssal Storytelling. It explores the sort of stories you can tell, the types of characters that might participate in them and some of the common problems and challenges involved in basing your game around Abyssals. Understanding of the fundemental wierdness of the Underworld and the powers therein is paramount, it is quite unlike anything else even in the rest of the alternate reality that is Exalted. It’s challenging as well, playing an evil character well is not just bloodsplatter, and the group should think carefully about whether they want to explore their darker sides in this way – but when done well, some excellent and memorable games can result. There’s plenty of scope for more than bloodsoaked destruction and mayhem, possibilities for intrigue and plotting abound. Several ideas are discussed here and I’ve been having ideas all the way through the book! This is a fascinating twist on conventional Exalted Storytelling and could prove rewarding to those prepared to commit to the level required. There’s a lot to absorb for both players and Storytellers if Abyssal characters are to be played to the full. Alternatively, a Storyteller who wants to make deathknights – and those they serve – major antagonists could add extra depth with the material herein. It is certainly well worth a read by anyone wanting to understand the full sweep and scope of the alternate reality that is Exalted.